FSB. The letters are not just familiar to fans of spy thrillers. They have come to symbolise Vladimir Putin's grip on power in Russia. Russia's secretive security agency has gained notoriety around the world with its intelligence and counter-terror operations. But with roots in the Soviet Union's KGB secret police, allegations of state-sanctioned killings and close ties to the president, it faces questions about its true nature and ambitions. What does the FSB do? The Federal Security Service (FSB) was set up in 1995, and is tasked with tackling perceived threats to the Russian state. Mr Putin ran the agency before he came to power. It co-operates with foreign police forces in fighting jihadists and some organised crime gangs. The FSB poured resources into fighting separatist rebels from Chechnya in two wars, in the 1990s and early 2000s. Russia has tense relations with several of its ex-Soviet neighbours. Part of the FSB's job is to prevent any pro-Western "colour" uprisings in Russia like Georgia's 2003 Rose Revolution and Ukraine's 2004 Orange Revolution. In 2015 the FSB was involved in a Cold War-style spy swap with Estonia. A Nato member, Estonia accused Russia of having kidnapped Eston Kohver, the security official exchanged for a jailed Russian spy. In 2002 the assassination of an Arab jihadist commander in Chechnya, known as Khattab, was attributed to the FSB. His Chechen comrades said he had received a letter laced with poison. But the Alexander Litvinenko murder case really put the FSB in the international spotlight. The ex-FSB officer, bitterly critical of President Putin, was poisoned in London with radioactive polonium-210 in 2006. Litvinenko, given asylum in the UK, had been branded a "traitor" in Russia. The official UK inquiry concluded that the killers probably had approval from Mr Putin and the then FSB chief, Nikolai Patrushev. Russia rejected the charges and made the main suspect, Andrei Lugovoi, an MP and national hero. Litvinenko had accused the FSB of running a top-secret hit squad called URPO for assassinating enemies. One of its targets, he said, was the powerful oligarch Boris Berezovsky, who died in the UK years after Litvinenko in 2013 in an apparent suicide. Just weeks before Litvinenko died, Russia passed a law giving the FSB authority to act against "extremists" and "terrorists" abroad. Some other prominent opponents of Mr Putin, including journalists, have died mysteriously, fuelling speculation about FSB "hits". Often the victims had other enemies, however, who could have targeted them. The FSB can officially warn individuals against "creating the conditions" for crimes. Critics see that as a KGB-style power of intimidation, enabling the state to stifle dissent. James Norton stars in McMafia, a TV drama based on Misha Glenny's 2008 non-fiction book exploring global crime networks. In their book on the FSB, called The New Nobility, Andrei Soldatov and Irina Borogan say Mr Putin expanded the FSB's powers by enabling it to send agents abroad for special operations, including intelligence gathering. 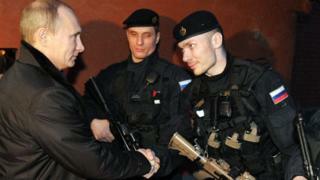 But Russia's equivalent of the British MI6 - the main overseas spy service - is the External Intelligence Service (SVR). Agents of the military spy service GRU also gather intelligence abroad. The FSB is integral to Russia's new doctrine of information warfare, which includes shaping public opinion abroad via social media. US officials believe the Russian state was linked to hacking and disinformation that targeted voters in the 2016 US presidential election. In March 2017 US authorities accused two FSB officers - Dmitry Dokuchaev and Igor Sushchin - of hacking Yahoo accounts and stealing the data of millions of users. The FSB has powerful legal tools to monitor internet traffic. A technology called Sorm lets it snoop on emails and phone calls; data has to be kept for 12 hours, by law, for possible inspection; virtual private networks (VPNs) and other anonymisation tools are restricted. Mr Soldatov says Russian telecoms providers have to give the FSB direct access to data. The real scope of FSB surveillance at any one time is not clear. The journalist says that, as with the Communist KGB, the fear of being spied on is a powerful weapon in itself. How close is the FSB to Putin? The headquarters in central Moscow is the Lubyanka - a symbol of FSB power. The KGB interrogated political prisoners there in Soviet times. The FSB's head Alexander Bortnikov reports directly to President Putin. In 2000, Mr Bortnikov's predecessor Nikolai Patrushev called his FSB operatives "modern nobles". On becoming president, Mr Putin gave top posts to former spies from St Petersburg. Olga Kryshtanovskaya, a leading Russian sociologist, says that "we are witnessing a restoration of the power of the KGB" under Mr Putin. During his first term as president, about one-third of government officials were "siloviki" - or "security guys", she said. Most of the elite - including Mr Bortnikov - are now subject to EU and/or US sanctions because of Russia's 2014 annexation of Crimea. Most have acquired huge fortunes and control key Russian resources. In the 1990s Mr Putin oversaw foreign trade in St Petersburg and some of his associates from that time have been linked to organised crime. Those links are documented by US researcher Karen Dawisha in her book Putin's Kleptocracy. The allegations also surfaced in the Litvinenko inquiry and in a major Spanish police investigation into the Russian mafia. The Spanish prosecutor, Jose Grinda, told US officials that Russia's security services "control OC (organised crime) in Russia" and "the FSB is 'absorbing' the Russian mafia". Reporting by the BBC's Laurence Peter.